Our experience with Princess BEFORE the cruise! So many phone calls with so many good and also dumb questions! Each and every time..we talked with people who were extremely helpful...fun...ready to pack up and come with us..professional, never rushed and seldom on HOLD! We felt like family ! This is our first cruise..big sister, little sister, her friend and my daughter and her friend...we are excited! Welcome MaryJane! So happy you have had a good experience with Princess. We enjoy Princess very much. You have questions ask away, we are a friendly bunch here. Chances are someone will have an answer for you. Jus be careful cruising can be addictive! Welcome to our corner of the internet, MaryJune - Glad to have you here! I have found that Princess is at the top of their game when it comes to Customer Service -- the same attitude you experienced on the phone will be found throughout the ships. I do not think there is such a thing as a dumb question (other than "Where can I plug in my rice cooker on board? ", but that is another thread altogether! ), so feel free to ask away. Someone will have an answer for you. Welcome to Cruiseline.com MaryJune. Please feel free to ask any question you have, chances are if you do not know it others will also benefit from the information. 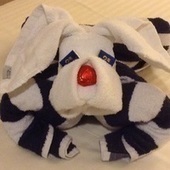 Most of us here on Cruiseline.com are very nice people and happy to be of help. We will answer your question even if we answered it a few months ago. As others have stated, cruising can be an addiction. You should have a great time on Princess, I was just on a Princess cruise and was impressed with the service, ship and food. Please post a review when you return from your cruise. I'll add my welcome! We have found the customer service at Princess to be outstanding. The best way to learn is by asking questions... after 37 cruises, I still have questions. The best advice I ever got was, relax and enjoy your cruise and don't try to do everything as you'll be exhausted at the end of the cruise. Good advice! There’s 6 of us girls going and between us all we may be able to try everything! Are you on this cruise? Would be nice to meet up with you. Thank you for responding. We do wish we could take pets. Could you imagine animals all over? Right!? Nevermind! How cool! They have a place to plug in my rice cooker! Happy to hear that! Not this one. Our next cruise is a Carnival Journeys cruise in February and as of right now, the one after that is January 2020. Have a wonderful adventure. Please be sure to let us know when you return, what you thought about it. Umm most items that have a heat element (even if internal like a rice cooker) are not allowed. There may be a place to plug it in but if packed will usually turn up on the scan and be confiscated. Sorry. See how easy it is to get carried away with being silly! There are a lot of things I might want to bring on a cruise that are not permitted, but never have I wanted to travel with a rice cooker or a hibachi grill.